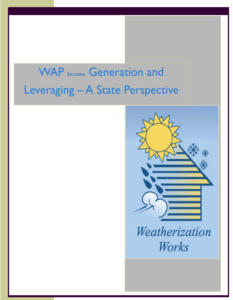 The “WAP Income Generation and Leveraging – A State Perspective” is the first comprehensive guide specifically targeted for WAP Grantees, highlighting resources and strategies when developing and supporting partnerships that provide additional resources to complement the U.S. Department of Energy’s (DOE) weatherization program funds. An appropriate guide for anyone interested in expanding their resources for low-income weatherization services, the focus is to help clarify the role of the Grantee, provide technical assistance and resources for leveraging efforts, and encourage the Grantee to take a proactive role in income generation and leveraging initiatives in their states. The goal of this project is to support local Weatherization Assistance Program (WAP) organizations to increase the size and impact of their federal program through local or state partnerships that provide more resources. The project team is based at the National Community Action Partnership to offer training and assistance to WAP subgrantees and their associations as they design and advocate for private partnerships and programs to coordinate with their federally-funded services. Since 2001, this project has been managed by Economic Opportunity Studies under the supervision of Meg Power. Since 2016, Community Action Partnership has been sharing in the work of the project and now is funded to manage the project work through 2019. View tools, templates, webinars, and other leveraging resources from the project HERE. Sign up for updates from the project HERE.